A.J. Jain, a student at the University of North Texas Health Science Center in Fort Worth. First you have to run for office in what are usually very tight and grueling campaigns. Then you spend days away from your practice and your family sitting in and preparing for meetings. Why would a physician want to serve on an AMA board or council? This week, Podcast TMA explores the answer through interviews with three Texas doctors on the front lines of national medical leadership. They are two physician leaders of the AMA and one doctor who is running for a seat on an AMA council. Our guests are: from Temple, Jim Rohack, MD, a member and former chair of the AMA Board of Trustees; from Austin, Joe Annis, MD, another member of the AMA board; and from Houston, Russ Kridel, MD, who is running this week for the AMA Council on Science and Public Health. They tell us what AMA officials do, how the election process works, and why Texas physicians should care that their colleagues are part of the AMA leadership. Our "Political Action Works" segment features Carlos Cardenas, MD, of McAllen, who tells us about State Sen. Juan "Chuy" Hinojosa, also of McAllen, and why doctors need to stay involved with their elected officials. Podcast TMA: Why a House? Podcast TMA this week begins a multi-part series looking at the upcoming meeting of the AMA House of Delegates. Download the show. Our guests this week are experts on the House of Delegates. Not only are they members of the Texas Delegation to the AMA house, they are also the two physicians who run the TMA House of Delegates. 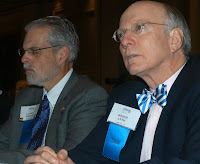 They are, from Houston, Bill Fleming, MD, the speaker of the TMA house, and from Fort Worth, Steve Brotherton, MD, the vice speaker. They explore the basic function of a house of delegates, explain why it's important for a medical association to have a house, and compare the AMA House of Delegates to the TMA house. The “Political Action Works” segment of this week's shoe features Ladon Homer, MD, of Fort Worth. He tells us about State Sen. Jane Nelson of Lewisville, the chair of the Senate Health and Human Services Committee, and why doctors need to stay involved with their elected officials.